I worked out this morning, and it was tough! I can barely move my arms. Now I'm eating Oreos. So I guess I'm still able to raise my hand to my mouth. I know you won't believe it, but I am almost finished with my son's tween room. Good thing, as he'll be a teenager this summer. Then I'll have to start all over. Not. I painted the final piece of furniture this weekend, so I've just got some tweaking to do and the room will be ready for its big reveal. 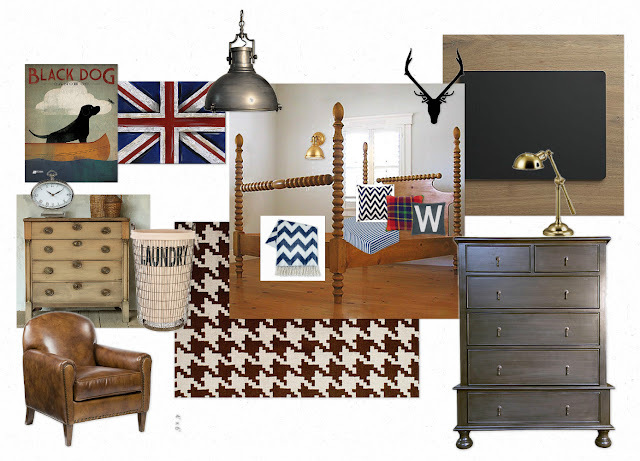 In the meantime, I thought I'd share a bedroom mood board that I created on Olioboard. I'm donating design services to our elementary school auction next week, and I wanted to create some sample mood boards for the display. This was so much fun, because I didn't have to worry about an actual budget. I just picked items I liked. Oh wouldn't it be great if that were real life? Have you ever used olioboard? I have Photoshop Elements, and I suppose I could figure out how to create design boards on there, too. But this is a really quick and easy way to play around with various pieces to create the aesthetic you desire. Then, you can hunt down less expensive items to mimic the look. Warning: It can be addictive. Just like Oreos. You are so funny! I'll take some of those Oreos! I can't wait to see your son's room. I know it's going to look fantastic. Love that mood board, too. If I had to do one I could afford, it would be pretty empty! You are too cute...love your board and makes me miss my tween boy so much! but he's about to give me a baby girl so I can do a baby girl Poppy (that's me) nursery and forget all about those red and blue plaids! I really must try creating some design boards, but, as you say, it can become addictive. I already have more than enough computer related addictions! LOL! Your son's room is going to be awesome. He must be excited. And, how generous of you to donate your design services. You're such an inspiration, Carolyn! I like your diet way more than mine...excercise AND oreos, sign me up! Your sons room is fabulous..I love how you made it look masculine but young and current. Lucky guy! That's a very cool looking board...loving the warm wood and plaid. Very cute. So nice of you to donate your services. I think it looks great! No budget would be the best. Hope you are well! Great mood board. I love Oreos too! Looking forward to tomorrow. Thank you so much for this info!! I have been using Picasa for this with my clients but this looks even easier and way cooler! Thank you, thank you!!! Hello. Facebook takes a [url=http://www.casino-casino.gd/]online baccarat[/url] wager back on 888 casino apportion: Facebook is expanding its efforts to introduce real-money gaming to millions of British users after announcing a train with the online gambling hard 888 Holdings.And Bye.